No, climate change is not experiencing a hiatus. No, there is not currently a “pause” in global warming. Despite widespread such claims in contrarian circles, human-caused warming of the globe proceeds unabated. Indeed, the most recent year (2014) was likely the warmest year on record. It is true that Earth’s surface warmed a bit less than models predicted it to over the past decade-and-a-half or so. This doesn’t mean that the models are flawed. Instead, it points to a discrepancy that likely arose from a combination of three main factors (see the discussion my piece last year in Scientific American). These factors include the likely underestimation of the actual warming that has occurred, due to gaps in the observational data. Secondly, scientists have failed to include in model simulations some natural factors (low-level but persistent volcanic eruptions and a small dip in solar output) that had a slight cooling influence on Earth’s climate. Finally, there is the possibility that internal, natural oscillations in temperature may have masked some surface warming in recent decades, much as an outbreak of Arctic air can mask the seasonal warming of spring during a late season cold snap. One could call it a global warming “speed bump”. In fact, I have. Some have argued that these oscillations contributed substantially to the warming of the globe in recent decades. In an article my colleagues Byron Steinman, Sonya Miller and I have in the latest issue of Science magazine, we show that internal climate variability instead partially offset global warming. We focused on the Northern Hemisphere and the role played by two climate oscillations known as the Atlantic Multidecadal Oscillation or “AMO” (a term I coined back in 2000, as recounted in my book The Hockey Stick and the Climate Wars) and the so-called Pacific Decadal Oscillation or “PDO” (we a use a slightly different term–Pacific Multidecadal Oscillation or “PMO” to refer to the longer-term features of this apparent oscillation). 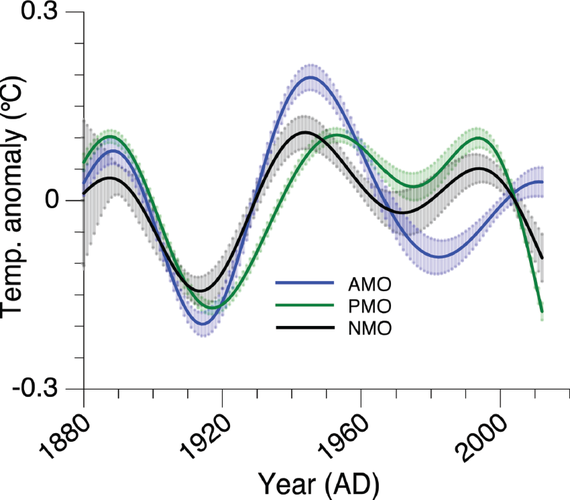 The oscillation in Northern Hemisphere average temperatures (which we term the Northern Hemisphere Multidecadal Oscillation or “NMO”) is found to result from a combination of the AMO and PMO. In numerous previous studies, these oscillations have been linked to everything from global warming, to drought in the Sahel region of Africa, to increased Atlantic hurricane activity. In our article, we show that the methods used in most if not all of these previous studies have been flawed. They fail to give the correct answer when applied to a situation (a climate model simulation) where the true answer is known. We propose and test an alternative method for identifying these oscillations, which makes use of the climate simulations used in the most recent IPCC report (the so-called “CMIP5” simulations). These simulations are used to estimate the component of temperature changes due to increasing greenhouse gas concentrations and other human impacts plus the effects of volcanic eruptions and observed changes in solar output. When all those influences are removed, the only thing remaining should be internal oscillations. We show that our method gives the correct answer when tested with climate model simulations. Estimated history of the “AMO” (blue), the “PMO (green) and the “NMO” (black). Uncertainties are indicated by shading. Note how the AMO (blue) has reached a shallow peak recently, while the PMO is plummeting quite dramatically. The latter accounts for the precipitous recent drop in the NMO. Applying our method to the actual climate observations (see figure above) we find that the NMO is currently trending downward. In other words, the internal oscillatory component is currently offsetting some of the Northern Hemisphere warming that we would otherwise be experiencing. This finding expands upon our previous work coming to a similar conclusion, but in the current study we better pinpoint the source of the downturn. The much-vaunted AMO appears to have made relatively little contribution to large-scale temperature changes over the past couple decades. Its amplitude has been small, and it is currently relatively flat, approaching the crest of a very shallow upward peak. That contrasts with the PMO, which is trending sharply downward. 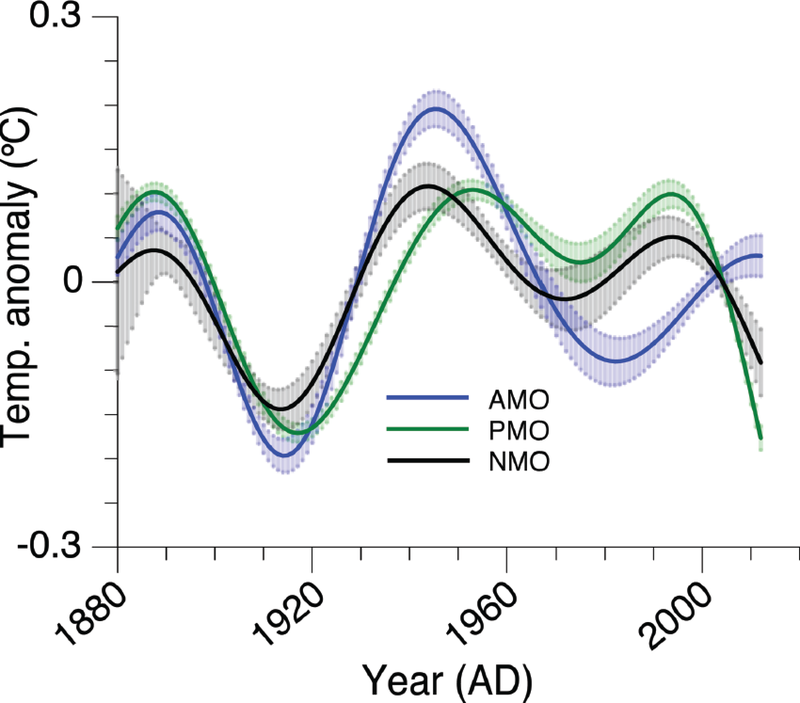 It is that decline in the PMO (which is tied to the predominance of cold La Niña-like conditions in the tropical Pacific over the past decade) that appears responsible for the declining NMO, i.e. the slowdown in warming or “faux pause” as some have termed it. Our conclusion that natural cooling in the Pacific is a principal contributor to the recent slowdown in large-scale warming is consistent with some other recent studies, including a study I commented on previously showing that stronger-than-normal winds in the tropical Pacific during the past decade have lead to increased upwelling of cold deep water in the eastern equatorial Pacific. Other work by Kevin Trenberth and John Fasullo of the National Center for Atmospheric Research (NCAR) shows that the there has been increased sub-surface heat burial in the Pacific ocean over this time frame, while yet another study by James Risbey and colleagues demonstrates that model simulations that most closely follow the observed sequence of El Niño and La Niña events over the past decade tend to reproduce the warming slowdown. It is possible that the downturn in the PMO itself reflects a “dynamical response” of the climate to global warming. Indeed, I have suggested this possibility before. But the state-of-the-art climate model simulations analyzed in our current study suggest that this phenomenon is a manifestation of purely random, internal oscillations in the climate system. That is perhaps the most worrying implication of our study, for it implies that the “false pause” may simply have been a cause for false complacency, when it comes to averting dangerous climate change.